It’s Festival Season!! The time of the year when party-frenzy Goa is transformed into an EDM lovers dream! 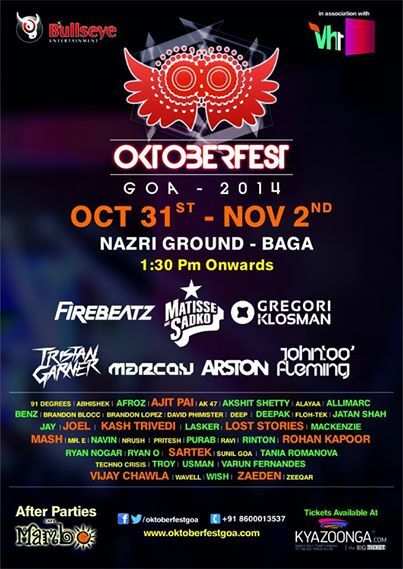 And OKTOBERFEST Goa 2014 is here to kick off this festive season! The Festival boasts an impressive line-up , with artists like Firebeatz, Gregori Klosman , Tristan Garner , Marco V, Arston, John ’00’ Fleming and a lot of Indian talent including Ajit Pai, Lost Stories, Sartek, Vijay Chawla, Zaeden. Their electrifying beats will make sure you don’t stop dancing during the festival! Matisse & Sadko 7:00 p.m. to 8:30 p.m.
Gregori Klosman 8:30 p.m. to 10:00 p.m.
Arston 7:00 p.m. to 8:30 p.m.
Tristan Garner: 8:30 p.m. to 10:00 p.m.
Marco V 7:00 p.m. to 8:30 p.m.
Matisse & Sadko are a duo of progressive house DJs and producers from Russia. They currently host a podcast at Radio Record entitled ‘Record Club‘, with an average of one episode per day. Firebeatz is a Dutch music producing duo made up of Tim Smulders and Jurre van Doeselaar that formed in Amsterdam in 2008. They have gained fame through their dance floor hits like “Dear New York“, “Here We F*cking Go” and “Helicopter” on the EDM scene working alongside well-known acts like Calvin Harris, Tiesto & Martin Garrix.